My blog post about honesty last week brought me lots of attention. I knew it would. I stick by my claim that at the time of writing, I had not yet intentionally lied to my son. However, no one is perfect. I had a moment of weakness last night that brought that record crashing down. I lied to my son and he caught me. We were at the Concert in the Park. Daddy was at work and Beau and I had arrived early to secure space for the other two families who would join us. 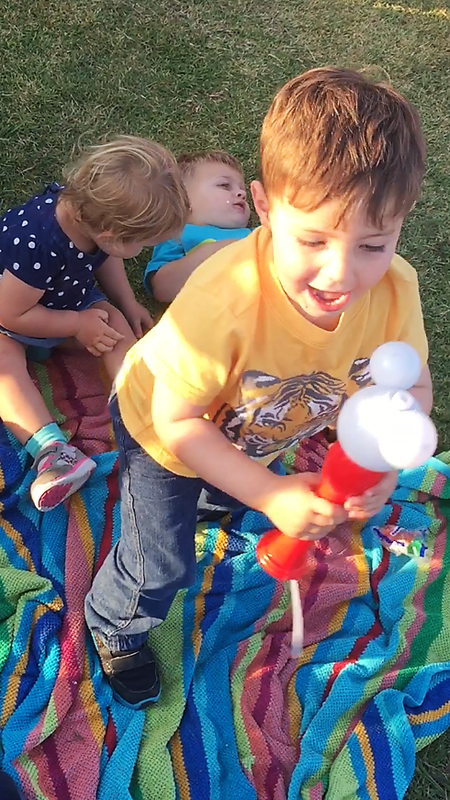 Beau brought his Mickey Mouse bubble wand to help pass the time but as the park filled up, the bubbles became a bit obnoxious for our neighbors. In a moment of distraction, I managed to wrest the wand out of his hand and sneak it into the wagon. He seemed not to notice or care, so I took the bubble solution off of the wand and capped it tight. Done. Rows and rows of chairs now filled the park. The band took the stage, and my anxiety over holding this big area for the families who were now late due to traffic began to rise. I despise saving seats. I can’t stand the feeling that others can’t sit because I need so much room. I sensed rows and rows of coveting eyes staring at the back of my head as the music started. Of course, just then, Beau noticed the bubble wand in the wagon, grabbed it, and asked, “Where bubbles, mama? Where bubbles?” “The bubbles are gone, Beau,” I lied. I couldn’t believe myself! Take it back, I thought. Tell him the truth! All week I had been engaged in conversations with my family and close friends about honesty, talking about how hard it is to keep every little word honest, whether certain comments pass the honesty test, and debating the importance -or not- of always telling the truth. My husband, especially, hung on my every word just to catch me slip up. He would have loved to have caught me saying this! But I didn’t take it back. I was stressed about saving these seats, about being watched and judged by the others in the crowd, and I did not want them to watch me argue with my son. So I let it ride. Convinced that the bubbles were in fact gone, Beau returned the wand to the wagon and I averted a possible meltdown. No problem, right? Later in the evening while our group enjoyed the music, one of the kids went into the wagon, found the bubble wand — and the bubbles!!! He brought them over to Beau and me asking me to put it together for him and I knew I was caught. There were more bubbles, Beau’s face seemed to say. I quickly stood up, politely yanked the wand and bubbles from his hands, and quickly buried them again in the bottom of the wagon. Beau followed me and reached into the wagon to hunt them out. I hugged him tightly and said, “I am sorry I told you there were no more bubbles. I should have told you that we shouldn’t use the bubbles here anymore. There are too many people here for bubbles now.” I felt terrible for having lied to him and even more terrible because I had been caught. Inevitably, the truth always comes out. 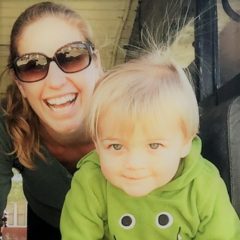 So do I believe that I spoiled my trust-relationship with my son thanks to this one moment of weakness? Certainly not. While disappointed, I can’t beat myself up. I recognize that we all make mistakes. We all lie despite our best efforts at honesty. But I do believe that stacked up over time, these little lies teach our children a lot about who we are, who they can trust, and about the kind of person they aspire to be. I still contend that it is absolutely in all of our best interests to do our best to be honest with our kids, even if we can’t manage it all of the time. The very real truth is that we begin our parenting journey with the best of intentions. We hold ourselves to the highest of expectations and the highest of standards. Then we realize that reality is a b-tch. Our standards slide and our kids quickly learn that we are not perfect. In time, they learn that they are not perfect, either. That is part of being human. By facing our mistakes honestly and showing our kids how we learn from them, we teach them how to positively handle their own imperfections. We need to forgive ourselves for being human and just aim to do our best every day.